After you spend all that time finding an amazing cake recipe and baking the cake, you don’t want the layers to dry out before you actually assemble the cake! Sometimes you have to store baked cake layers for later. You might be decorating an elaborate cake or maybe you have to run to the store to buy more butter. Whatever the reason, by learning how to store cake, you can keep the cake fresh. Cool the cake until I can safely handle the pan with my bare hands. DO NOT let the pan cool too long or your cake could get stuck! I love my Fat Daddios Pans . Then I run a butter knife around the edge of the pan, keeping the knife pressed against the side of the pan. I don’t gouge the bottom of the pan. If it’s a fancy pan, I use a small heatproof spatula in places where the cake might stick but I keep the cake safe. Confidently and swiftly flip cake pan over onto plastic wrap so the cake will fall out of the pan. I remove the pan and gently fold the plastic wrap around the still warm cake. Yes, that’s what I do. I don’t let it cool to room temp despite popular wisdom. **Side note on this at the bottom. I then roll out the second piece of plastic wrap and lay that over the top and sides of the wrapped cake layer. I have to flip the cake over to seal the second layer of plastic wrap. 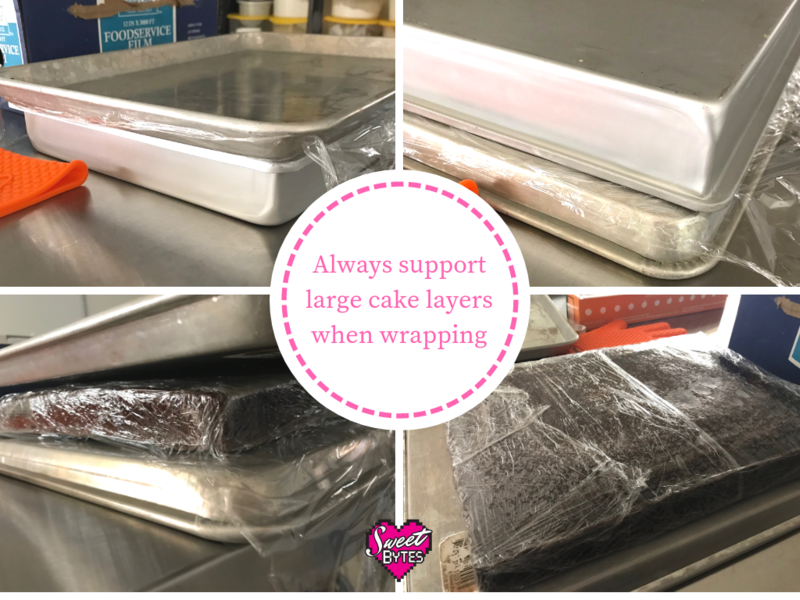 Since the cake layer is still warm, I use a Corrugated Cake Circle or my Cake Lifter to support the layer as I flip it over to finish cover it in plastic wrap. I lay the cake on the Cooling Rack and let come to room temperature. Often times, especially for decorated cakes, baking and assembling the cake will happen over the course of days, not hours. I always bake the cake layers at least one day ahead, but sometimes I store baked cake layers up to a week before decorating them. The cake doesn’t go stale or become “unfresh” as long as I follow the proper storage method. IF I am going to complete the cake within 24 hours, I leave the cake at room temperature until I am ready to start working on it. IF it is going to be more than 48 hours, I place the layers in the freezer to wait for me. I usually don’t leave it there for more than a few days, but I promise the cake layers will be fine for 3-6 months if you keep them wrapped airtight. If I have extra cake layers or we don’t eat all of a whole cake, I freeze it until I use it and it’s always been GOOD. My freezer isn’t prone to frost, and I wrap my cakes completely airtight, and that’s why they stay fresh. People who don’t bake a lot may not appreciate the workload or the salvation of a freezer, but your freezer is your best friend as a baker. Indeed, you will be able to pull off amazing feats of baking by spreading out your workload. It also makes sense not to toss out something just because it wouldn’t stay fresh in the refrigerator. The freezer is an amazing piece of technology. A lot of world-famous bakers and cakers freeze all of their cakes, even IF they are making it all on the same day. There are very good cases for freezing time. Many, swear that the same recipe can be transformed with a good freeze. If you aren’t sold, I challenge you to run your own experiments and let me know how they go. 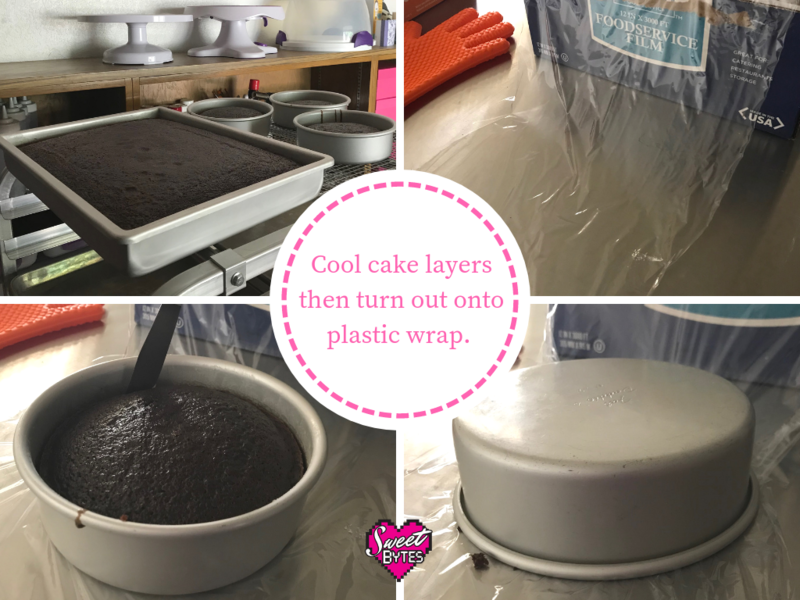 A large 1/2 sheet, full sheet or otherwise hard to handle cake layer can be treated just like your little round cake layers, you just have to get a little crafty. I use my sheet pans to help me support the cake. You could also use a large cake cardboard or foamboard. Basically, always keep the cake supported and you will never have any problems. How long does cake last in the fridge? The standard for ready to eat food is 7 days from the date it was made. Longer than that and you should go ahead and freeze it. How long can you freeze cake? The answer for taste and safety is 4 to 6 months, but many bakeries put a 1-month time limit on items in their freezer just to be certain there is no freezer burn or taste of freezer. If you choose a standard time and stick with it, you’ll be safe. Why do I need to serve the cake at room temperature? This applies especially to cakes made with real butter. When a cake has a large amount of butter in the recipe, it will become very firm when cold, much like a stick of butter. When the cake returns to room temp, it will be soft, much like a stick of butter. 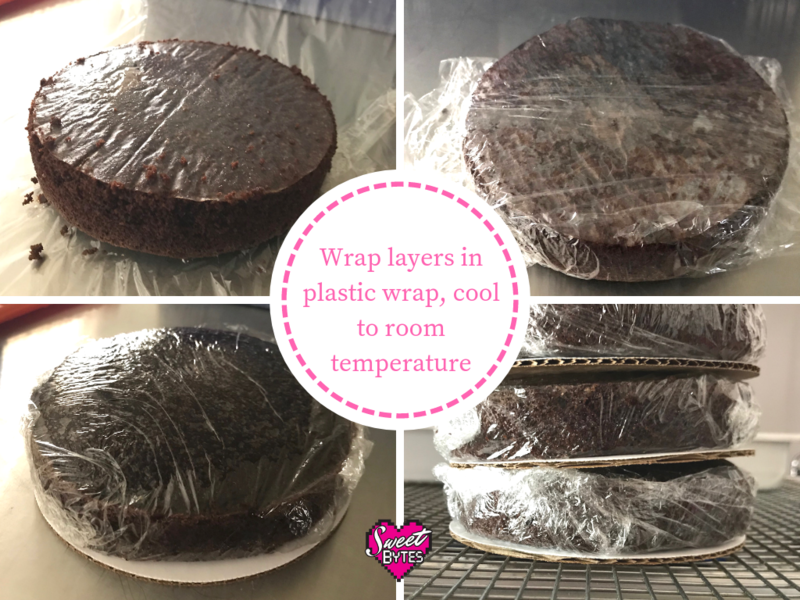 A popular cake forum member swears that wrapping cakes while they are warm is unsafe because it keeps the temperature in the wrong zone for too long and creates an unsafe moisture level that could promote the growth of pathogens. She/ he then adds the credential that she/ he is a Certified Food Safety Manager and Teacher. This credential doesn’t make her/ him right. A. Be a food that requires time/ temperature control for safety (TCS). B. Be a TCS food AND remain in the danger zone (70- 104 degrees for more than 2 hours. AHHHHH, I had been wanting to get that off of my chest for well over a year. Sometimes it just doesn’t feel worth it to argue online, you know? I need you to know that the information was false, because of SCIENCE. (Plus, I too, am a Certified Food Safety Manager). If you have a baking question for me, please, send me an email or leave a comment and I will do my best to find your answer! I may even write a whole article about it. Stay in touch by signing up for Delicious News!